Growing up, I was never a big fan of spritz cookies. They all tasted dry and bland. A few years ago, I wanted to make spritz cookies with my children because it seemed like a fun way to make cookies. We bought a Cookie Press (last year I bought a new Cookie Press that I absolutely love) and I went in search of the perfect spritz cookie recipe. The recipe I found included cream cheese. Cream Cheese Spritz cookies. I thought that sounded interesting. So we started using this recipe. I really love to make star-shaped cookies during Advent with my cookie press. One day I had exactly one ounce more cream cheese then the recipe calls for and I didn’t want to waste it. So I mixed it in and took out two tablespoons of butter. The result was even just a little bit yummier. I’m never hooked on the first cheesecake spritz cookie that I pull out of the oven, but by the time I have two or three of these cookies I am reminded why I find them addicting. They are so good! I wouldn’t exactly call these cookies moist, but they are more moist then any other spritz cookie we’ve tried. Cooking time is also key in keeping them from drying out too much. The cream cheese gives just a hint of cheesecake flavor. We add dye to make wreaths and trees, and also make some without dye. My children naturally enjoy adding all kinds of Christmas sprinkles, but I prefer sugar so we make some of each! The instructions for this cookie are pretty simple. Bring Butter and Cream Cheese to room temperature. Mix 1 Cup of Butter (minus two tablespoons) with 4 ounces of Cream Cheese and 1/2 Cup of Sugar plus 1 tablespoon. Add in 1 tsp of Vanilla. Gradually add 1 3/4 Cups of Flour, 1/4 teaspoon salt and a small amount of food coloring if desired. Make a double recipe to use an 8 ounce block of cream cheese as typically sold in the US. Press through a cookie press into your desired shape onto an ungreased cookie sheet. Bake at 375* for 10-12 minutes — until set but not brown. 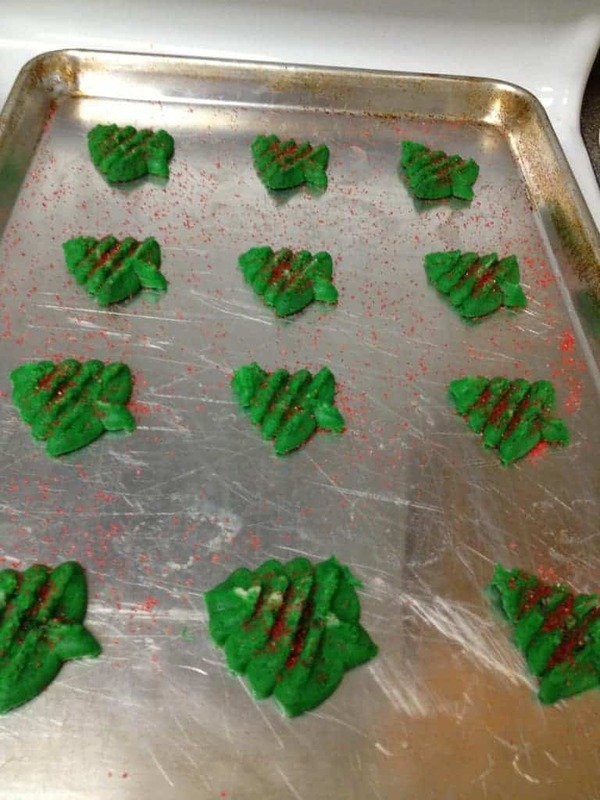 The Christmas trees shown here were made with green food coloring added and sprinkles before baking. The stars shown here were made with a light dusting of food-safe silver spray and tiny silver star sprinkles, both from Wilton. You can make any variation of colors and shapes for any season. My most recent favorite is a swirl of red and white dough. Mix 1 Cup of Butter (minus two tablespoons) with 4 ounces of Cream Cheese and 1/2 Cup of Sugar plus 1 tablespoon. Add in 1 tsp of Vanilla. Mix remaining dry ingredients and add gradually with food coloring if desired. Make a double recipe to use an 8 ounce block of cream cheese as typically sold in the US. Press through a cookie press into your desired shape onto an ungreased cookie sheet. Bake at 375* for 10-12 minutes — until set but not brown for a soft cookie reminiscent of cheesecake. Those are so pretty, Amy!! Those sound wonderful! Thanks for sharing!